Total revenue reaches 26.6 billion euros, and premiums exceed 22.54 billion euros. The impact of currency depreciations on premiums stands at 1.44 billion euros. Excluding this effect, premiums would have grown by 2.1 percent. The combined ratio improves by half a percentage point to 97.6 percent. MAPFRE Spain grows by more than 10 percent, compared to a market increase of 1.34 percent, consolidating itself as the Group’s principal earnings driver, and an example of profitable growth. El beneficio de MAPFRE RE asciende a 149 millones de euros. MAPFRE RE generates profits of 149 million euros. 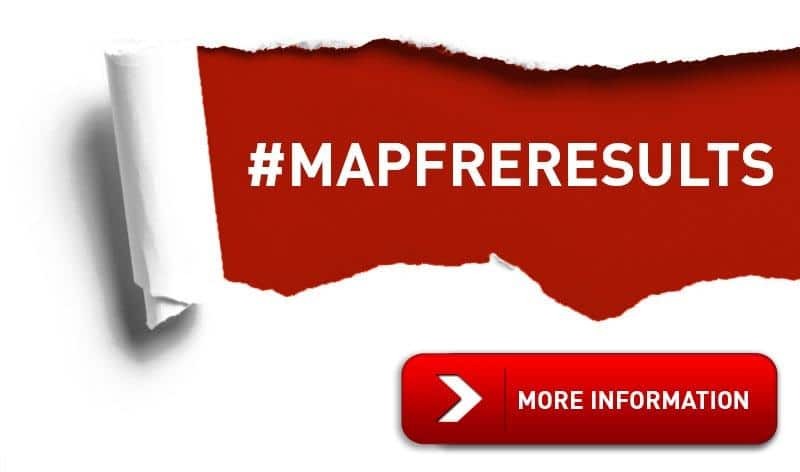 MAPFRE ASISTENCIA concludes its restructuring and approaches gross profit equilibrium. MAPFRE to pay its shareholders 0.145 euros per share, charged against the 2018 results. More than 73 percent of MAPFRE-managed investments in corporate issuers are ESG-certified. MAPFRE generated an operating result of 702 million euros in 2018, 0.3 percent more than the previous year. However, at the end of 2018, the company decided to strengthen its balance sheet by allocating 173 million euros to a partial impairment of goodwill for the insurance operations in the United States, Italy and Indonesia. This allocation was undertaken with a view to adapting to new market circumstances, maintaining profitability for shareholders while laying the foundations for continued profitable growth. After allowing for this allocation, net earnings for the year were 529 million euros, 24.5 percent lower than that recorded in 2017. The fall in financial income due to low interest rates, the depreciation of currencies (which impacted results in the amount of 17 million euros) the cost of catastrophic events (principally hurricanes and winter storms), with an impact of 97 million euros on the reinsurance business, and the restatement of the results for subsidiaries in Argentina (considered a hyperinflationary country in that accumulated inflation is over 100 percent for the last three years) that produced a negative impact of 18 million euros, all influenced the year’s result negatively. Total Group revenues were 26.6 billion euros, representing a fall of 5 percent, mainly due to currency depreciation in the main countries in which MAPFRE operates, especially the US dollar, the Brazilian real, the Mexican peso and the Turkish lira, compounded by falling financial returns. Premiums stood at just over 22.54 billion euros (-4 percent), also influenced by the effect of currency depreciation. In fact, the impact of this depreciation on premiums accounted for 1.44 billion euros. At constant exchange rates, premiums would have grown by 2.1 percent. It is important to note the positive performance of Spain, with premiums of 7.52 billion euros, representing growth of 10.3 percent, compared to the 1.34 percent increase recorded by the sector overall. The Iberia Regional Area, the first market in which a corporate strategy based on profitable growth was implemented, has underpinned its position as the Group’s growth engine. Also noteworthy is the improvement in the Group’s combined ratio, which at the end of 2018 stood at 97.6 percent, half a percentage point better than 2017. Equity stood at 9.2 billion euros, while shareholders’ equity amounted to just under 8 billion euros at the end of 2018, with total assets at 67.29 billion euros. The Group’s investments reached 49.27 billion euros at the end of 2018, with 56 percent corresponding to sovereign debt and 18.1 percent to corporate fixed income, while 4.9 percent was invested in equities and 4.5 percent in cash, a similar percentage to the amount assigned to real estate investments. Some 67 percent of total investments in fixed income held a credit rating of A or higher. At the end of September 2018, the Solvency II ratio stood at 207.9 percent, compared with 201.7 percent in June, with 88 percent high-quality capital (TIER 1). It is important to note that the solvency ratio remains both robust and stable, thanks to a high level of diversification and stringent investment and management policies. The premiums of the Insurance Unit at the end of 2018 stood at 18.74 billion euros (-3.3 percent). → In the Iberia Regional Area (Spain and Portugal), business increased by 10 percent, with total premiums reaching 7.66 billion euros, with profits of 481 million euros (-6 percent). Eliminating the extraordinary items of 2017 and 2018, profits would have grown by 5.3 percent. The solid performance of Spain is noteworthy, with premiums growing by 10.3 percent, to 7.52 billion euros, and a combined ratio standing at 93.7 percent, a percentage that is even better in the Automobile business, which stood at 90.8 percent. Automobile premiums amounted to 2.28 billion euros, up 2.2 percent (compared to growth of 1.94 percent for the market). The number of insured vehicles exceeds 5.7 million, which represents an increase of 132,000 over the previous year. General P&C business grew by 13.5 percent to 1.88 billion euros, and the Health and Accident business was up 5.4 percent to 578 million euros. In the latter line, the improvement of 2 percentage points, to 97.4 percent, in the combined ratio is significant. MAPFRE VIDA saw a 16.4 percent increase in business, with premium volume of 2.63 billion euros, despite a 1.68 percent contraction for the market overall. This growth was driven by good business performance across all channels. Mutual funds stood at 3.24 billion euros, while pension funds totaled 4.87 billion euros. → In Brazil, premiums at the close of the 2018 financial year stood at 3.97 billion euros (-12.6 percent), significantly affected by the depreciation of the Brazilian real, which fell by 16 percent. 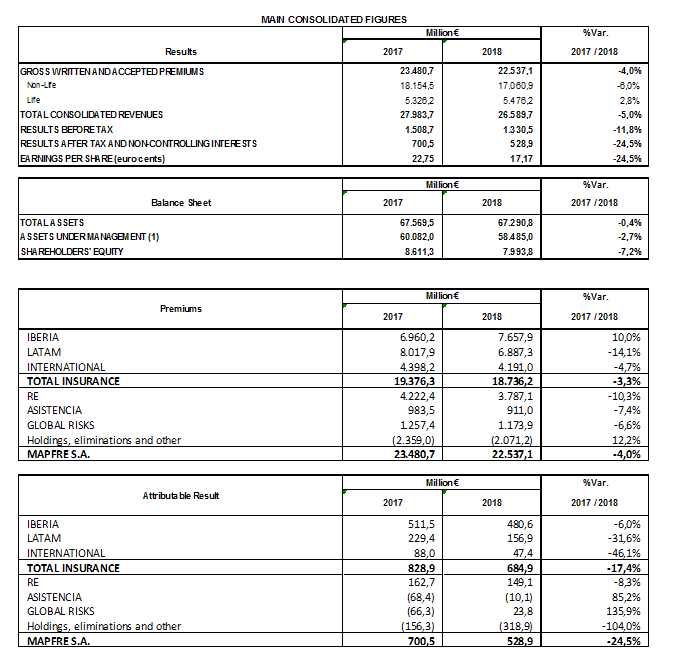 General P&C contributed the most in terms of premiums (1.6 billion euros) followed by Life, with 1.36 billion, and Automobile, with 1.01 billion euros. → The LATAM North Regional Area produced 1.31 billion euros (-26.1 percent). Mexico contributed 719 million euros (-39.2 percent), strongly affected by the depreciation of the Mexican peso (-7 percent) and by the absence this year of the Pemex policy premium, which is renewed every two years. Without this effect, growth in local currency would have been 9 percent. Earnings from the Mexico business were 18 million euros, more than three times what was achieved in 2017. Most of the countries in the region grew in terms of local currency, and the Non-Life combined ratio stood at 98.1 percent. → Premiums from the LATAM South Regional Area stood at 1.61 billion euros (-5.5 percent), highlighting the contribution of Peru, with 492 million euros and growth of 4.7 percent (+10 percent in local currency), and Colombia, with 391 million euros (-0.7 percent in euros, +3 percent in local currency). → In the North America Regional Area, premiums were 2.42 billion euros (-4.1 percent). The business in the United States totaled 2.04 billion euros (-7.4 percent), which was negatively affected by the depreciation of the dollar (-3.5 percent) and the exit from several states, an operation that is part of the readjustment of the business aimed at boosting profitable growth. Puerto Rico increased premiums by 18.4 percent to 387 million euros, with a positive result of 27 million euros, compared to losses of 17 million euros in the previous year, and an improvement in the combined ratio, which came out at 88 percent. → Premiums for the EURASIA Regional Area (which groups together operations in Europe –except Spain and Portugal–, the Middle East, Africa and Asia) ended the year at 1.77 billion euros (-5.6 percent). Turkey produced 486 million euros (-25.7 percent), heavily influenced by the depreciation of the Turkish lira (-25 percent) and a strict underwriting policy, particularly in the Automobile third-party liability line, which is part of the profitable growth strategy. Italy increased business by 0.6 percent to 474 million euros, while Malta contributed 390 million, 11 percent more than the previous year. In Germany, growth was 5.3 percent, up to 327 million euros. In Indonesia, despite an 8.8 percent currency depreciation, business maintained a growth trend, increasing by 42.1 percent to 62 million euros. The Reinsurance Unit registered premiums of 3.79 billion euros for 2018, 10.3 percent off the previous year’s figure, due to, among other reasons, the fact that a significant part of this unit’s business comes from non-European countries, whose currencies have experienced sharp depreciations. The result at RE amounted to 149 million euros (-8.3 percent), due to various catastrophes that impacted on the attributable result of this unit in the amount of 97 million euros. Premiums at the Global Risks Unit reached 1.17 billion euros (-6.6 percent), with profits of 24 million euros, compared to losses of 66 million euros last year, due to the exceptional catastrophic events of 2017. The combined ratio improved significantly, standing at 91.9 percent, thanks to a lower loss experience, which was greatly reduced. Lastly, revenue at the Assistance, Services and Specialty Risks Unit for 2018 was 983 million euros (-11.7 percent), the result of the restructuring of this business that began in previous fiscal years. The Board of Directors has also approved the appointments of Angel Dávila and José Manuel Corral as new members of the Executive Committee. Angel Dávila has been General Counsel and Secretary of the Board of Directors since 2011. Holding a degree in Law and Business Studies, he began his professional career in MAPFRE in 1992. José Manuel Corral has been Group Chief Business and Clients Officer since the middle of last year. José Manuel graduated with a degree in Economic and Business Science and joined MAPFRE in 1993.